When researching costume jewellery, I often come across the name Little Nemo. This American brand was manufactured by Brier Manufacturing, which was located in that famous costume jewellery-making hub of Providence, RI. The label took its name from the comic strip (which also inspired Tom Petty’s “Running Down A Dream” video). At one point, Brier was the second biggest jewelry maker in the US (after Coro). The line was signed L/N, Nemo and Little Nemo (though some not signed at all, rather it would be sold on a card or with a hang tag). 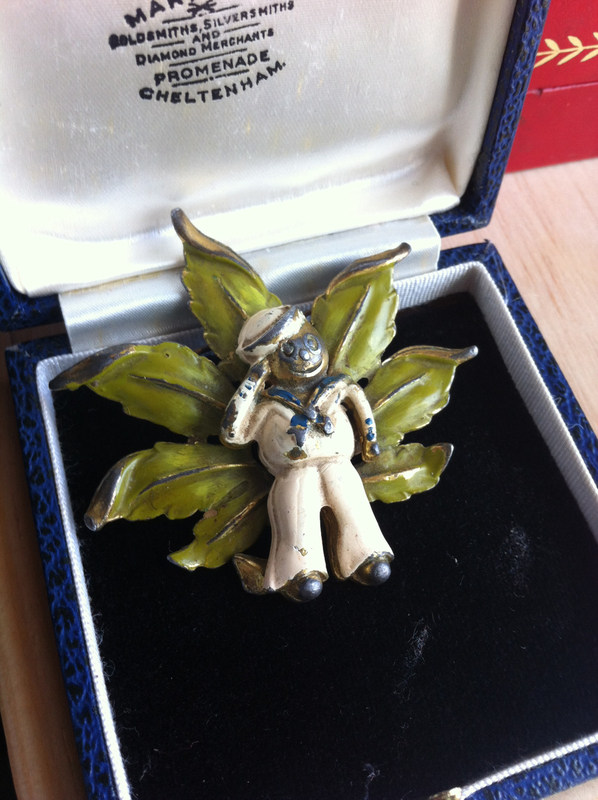 While the business started in 1913, it had its heyday in the pre- and post-WWII years making patriotic pot metal pieces like the sailor brooch pictured above. This cute navy dude is signed L/N and was used in countless Little Nemo piece. They stopped production in 1978. I had fun researching this guy and finally having a Little Nemo piece in my possession, but it’s time to send him to the Etsy shop to find his forever home.